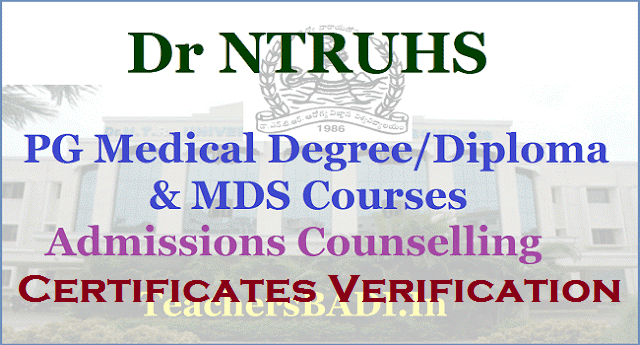 Dr NTRUHS Certificates verification schedule for PG Medical Degree/Diploma courses & MDS Courses Admissions 2018: Dr NTR University of Health Sciences Andhra Pradesh announced the Dr NTRUHS PG Medical Degree/Diploma & MDS Courses Admissions 2019 notification and invited the applications for Admission into Post Graduate Medical Degree/Diploma & MDS Courses 2019 available under Dr. NTR UHS, Vijayawada and also for PG Medical courses in SVIMS, Tirupati.Now, Dr NTRUHS Certificates verification notification for PG Medical Degree/Diploma courses & MDS Courses Admissions. 2019. Dates of verification of original certificates (PG Medical): 03.04.2019 to 05.04.2019. Date of release of State final merit position for PG Medical after verification of original certificates: 10.04.2019. Dr. NTR UHS hereby notify that the web based counseling will be conducted for admissions into Post-Graduate Medical Degree / Diploma Courses and MDS Courses in colleges under Dr.NTR UHS and the PG Medical Courses available in SVIMS, Tirupati for the academic year 2019-2020. The candidates who have submitted the online application form in response to this office notification and figured in the Provisional Merit list of PG Medical / MDS displayed in the Website of Dr.NTR UHS are informed to attend at any of the following helpline centers along with Printout of application duly signed and enclosed all the required certificates for verification of their original certificates as per the schedule given below. After verification of original certificates, the final merit Position of the candidates will be determined and notified so that the candidates in the final Merit Position shall exercise web options for a seat in Post-Graduate Medical Degree / Diploma Courses and MDS Courses as the case may be as per the schedule to be notified separately. Processing Fee: Candidates have to pay to Dr. NTRUHS, Vijayawada a non-refundable processing fee of Rs.2500/- for OC/BC Candidates and Rs.2000/- for SC/ST Candidates by way of Cash at the time of verification of original certificates. UNIVERSITY REGISTRATION FEE: Candidates have to pay University fee as per norms of Dr.NTR UHS. ORIGINAL CERTIFICATES TO BE PRODUCED AT THE HELPLINE CENTERS FOR PG MEDICAL COURSES: Candidates attending for verification of certificates should submit the following Original Certificates at the verification counters. Certificate of Internship Completion on or before 15-04-2019. Medical Council Registration Certificate: Candidates obtained MBBS or equivalent Degree from outside India produce Permanent Medical Registration Certificate issued by State Medical Council / Medical Council of India. Study Certificates from 1st MBBS to final MBBS. Candidates who studied MBBS in Christian Medical College (CMC), Dichpalli, shall submit study / Bonafide certificates from 6th class to Intermediate / 12th standard and study certificates from 1st MBBS to final MBBS. Candidates obtained MBBS Degree from outside the State of Andhra Pradesh / Telangana, shall submit 10 years residence certificate of father / mother /Spouse issued by Competent Authority indicating years of residence and other relevant certificates if any in support of eligibility for UR seats as per Presidential order. Candidates obtained MBBS or equivalent Degree from outside India shall produce 10 years residence certificate of father/mother/Spouse issued by Competent Authority indicating years of residence and other relevant certificates if any in support of eligibility for UR seats as per Presidential order. They shall also produce Permanent Medical Registration Certificate issued by State Medical Council / Medical Council of India. Permanent Caste certificate in case of BC/SC/ST candidates issued through e – seva / Mee-seva. Latest Service Certificate in respect of candidates claiming reservation under Service Quota if applicable issued by the concerned Directorate. Latest Physically Challenged (PH) certificate in respect of candidates claiming under Physically Challenged quota. Photo identity proof viz college ID/PAN card / Passport / Driving License / Voter’s ID. ORIGINAL CERTIFICATES TO BE PRODUCED AT THE HELPLINE CENTERS FOR MDS COURSES: Candidates attending for verification of certificates should submit the following Original Certificates at the verification counters. NEET MDS – 2019 admit card and score card. Date of Birth Certificate (X class). Intermediate / 12th standard certificate. All marks memos from 1st BDS to final BDS. Study Certificates from 1st BDS to final BDS. Candidates who studied BDS in Government Dental College & Hospital,Vijayawada and Hyderabad shall submit study / Bonafide certificates from 6th class to Intermediate / 12th standard. TUITION FEE: a) The tuition fee is to be paid at Medical/Dental colleges under Dr.NTR UHS. The tuition fee will be as fixed by the State Government. b) The tuition fee is to be paid as per the SVIMS norms in respect of candidates selected in SVIMS, Tirupati. The in-service candidates eligible under service quota and fulfilling the eligibility criteria of remaining service as per G.O.Ms.No.122, HM & FW (E2) Department, dt.13-4-2006 shall attend the counseling with the latest service certificate (Original) issued by the concerned Directorate for the year 2019-18. Candidates will not be allowed for verification without producing original certificates. Custodian certificates will not be allowed under any circumstances. Candidates those who are having caste certificates issued by Telangana State, should attend for verification of their certificates at PGRR Center, OU Campus, Hyderabad. Candidates those who are having caste certificates issued by the State AP, should attend for verification of their certificates at any of the remaining three centers (Vijayawada, Visakhapatnam & Tirupati). OC candidates can attend at any one of the Four centers of their choice. (Hyderabad, Vijayawada, Visakhapatnam & Tirupati). Only candidates shall appear for the verification of certificates in person as per schedule notified. Proxies are not allowed. All the Candidates attending for certificate verification shall bring three (3) sets of Xerox copies of all the certificates. Candidates please note that this is the first and final phase of verification of original certificates. No further phase of verification of certificates will be done. But, candidates who got verified their original certificates can only exercise their web options in the subsequent phases for allotment if any. VIII. Mere attending to the verification of certificates does not confer any right for a seat as more number of candidates are called than the number of available seats. The seat allocation will be done as per the procedure given in G.O.P.No.646, Education (w) dept. Dt.10-07-1979 as amended in G.O.Ms.No.42, Higher Education dept., Dt.18-05-2009. The procedure for preparation of seat matrix and selection into PG broad specialty in the competent authority quota will be as per G.O.Ms.No.43, HM&FW (E1) Dept., dated 13-03-2013 as amended in G.O. Ms No.88 HM & FW (E1) Dept. 21-05-2014 as amended from time to time. Seats will be allocated separately for Non-Service and Service candidates.